This is not Black Beauty... it's a different story all together. A boy has a rough time after his mother and father divorce and he has to move in with his grandfather. But then his grandfather insists he learn how to ride Beauty, the horse his mother rode when she was a girl. This book is amazing but it's also heart breaking. My mom and I read it and we laughed and cried. 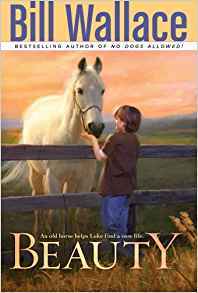 This is one of my all-time favorite horse book. It's so sad! One of the Best I've Ever Read. I absolutely adored this book, and all its contents, and I openly admit to bawling my eyes out during it. This is my favorite book forever! It it is a great story! Bill Wallace is one of my favorite authors! Great book! I did cry though. This will touch the hearts of horse lovers. She was an old horse, but she still had a lot of life left in her. And she was the best friend Luke needed after the pain of his parent's divorce and the move to Oklahoma to live with his difficult grandfather. Luke could have had a younger horse, one better able to keep up with a boy's adventures. But it was Beauty that Luke loved. He found himself sharing his hopes, dreams, and fears with the old horse. With Beauty, Luke was finally able to enjoy life again. Until one night, in a wild storm, Beauty escapes from the corral and gets caught in a terrible trap, and Luke is faced with the most difficult decision he's ever had to made.